A fundamental problem in psychiatry is that there are no biological markers for diagnosing mental illness or for indicating how best to treat it. Treatment decisions are based entirely on symptoms, and doctors and their patients will typically try one treatment, then if it does not work, try another, and perhaps another. 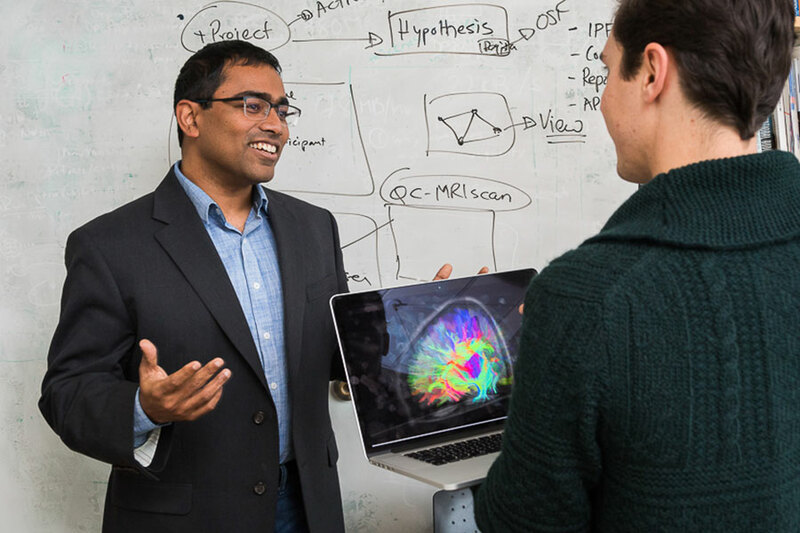 Satrajit Ghosh hopes to change this picture, and his research suggests that individual brain scans and speaking patterns can hold valuable information for guiding psychiatrists and patients. His research group develops novel analytic platforms that use such information to create robust, predictive models around human health. Current areas include depression, suicide, anxiety disorders, autism, Parkinson’s disease, and brain tumors. 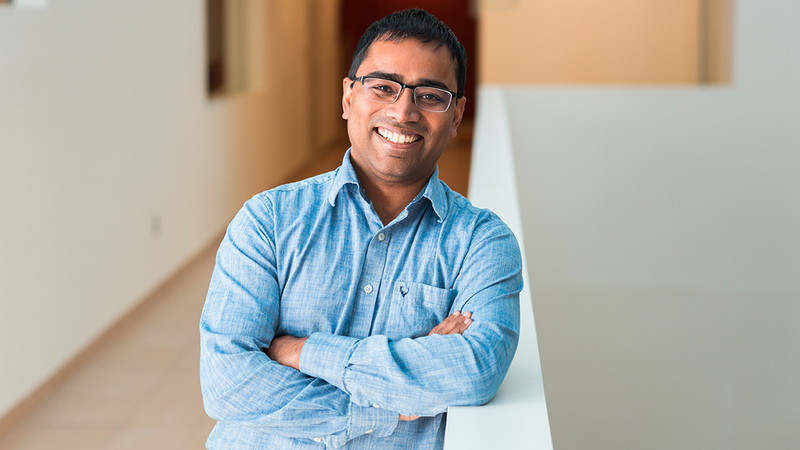 Ghosh’s research interests span computer science and neuroscience, specifically in the areas of applied machine learning, signal processing, and translational medicine. His current research portfolio comprises projects on spoken communication, brain imaging, and informatics to address gaps in scientific knowledge in three areas: the neural basis and translational applications of speaking, precision psychiatry and medicine, and preserving information for reproducible research. Satrajit Ghosh received his BS (with Honors) in Computer Science at the National University of Singapore and his PhD in Cognitive and Neural Systems from Boston University. In addition to his role at the McGovern Institute, Ghosh is an assistant professor in the Department of Otolaryngology at Harvard Medical School. He is also the director of Data Models and Integration project of ReproNim, an NIH P41 Center for Reproducible Neuroimaging Computation. He is also a co-editor-in-chief of BMC NeuroCommons, a journal focussed on enhancing the digital Commons for neuroscience through increased data, software, and reproducible results. Ask the Brain: Why do I talk with my hands? Nipype: A flexible, lightweight and extensible neuroimaging data processing framework in python. ​Gorgolewski, K., Burns, C.D., Madison, C., Clark, D., Halchenko, Y.O., Waskom, M.L., Ghosh, S.S. (2011). Frontiers Neuroinformatics 5, 13. Predicting treatment response in social anxiety disorder from functional magnetic resonance imaging. Doehrmann, O., Ghosh, S.S., Polli, F.E., Reynolds, G.O., Horn, F., Keshavan, A., Triantafyllou, C., Saygin, Z.M., Whitfield-Gabrieli, S., Hofmann, S.G., Pollack, M., Gabrieli, J.D. (2013). JAMA Psychiatry 70, 87-97. Decreased cerebellar-orbitofrontal connectivity correlates with stuttering severity: Whole-brain functional and structural connectivity associations with persistent developmental stuttering. Sitek, K.R., Cai, S., Beal, D.S., Perkell, J.S., Guenther, F.H., Ghosh, S.S. (2016). Frontiers Human Neuroscience 10, 190. Guell, X, Goncalves, M, Kaczmarzyk, JR, Gabrieli, JDE, Schmahmann, JD, Ghosh, SS et al.. LittleBrain: A gradient-based tool for the topographical interpretation of cerebellar neuroimaging findings. PLoS ONE. 2019;14 (1):e0210028. doi: 10.1371/journal.pone.0210028. PubMed PMID:30650101 PubMed Central PMC6334893. Esteban, O, Markiewicz, CJ, Blair, RW, Moodie, CA, Isik, AI, Erramuzpe, A et al.. fMRIPrep: a robust preprocessing pipeline for functional MRI. Nat. Methods. 2019;16 (1):111-116. doi: 10.1038/s41592-018-0235-4. PubMed PMID:30532080 PubMed Central PMC6319393. Guell, X, Schmahmann, JD, Gabrieli, J, Ghosh, SS. Functional gradients of the cerebellum. Elife. 2018;7 :. doi: 10.7554/eLife.36652. PubMed PMID:30106371 PubMed Central PMC6092123.